Ever since I posted some notes on Anne Lamott (August 29), I’ve been mulling over her comments on the importance of truth in writing, and how that relates to blogging. Overtly, her words do not have to do with the online world. Bird by Bird, Lamott’s book on writing, was published in 1994. By then, a few people had learned not trust everyone in a chatroom, but we were still years away from the need to decide what sorts of truth to reveal to what sorts of people in our Facebook profiles. Conclusion 1: If we didn’t know it before, we have learned online that there are many kinds of truths. Some are for Friends and some are for Everyone, and it’s good to know the difference. I don’t think I’m being picky; it’s just that when someone talks about “truth” I am never quite sure what they mean. “Truth or reality, or whatever you want to call it is the bedrock of life,” says Lamott. Hmmm. Well we all agree that the sun sets in the west, but luckily for us bloggers, there is little consensus on truth beyond such “obvious” things. If there were – if we learned any final realities in school, there would be little for us to write about. Conclusion 2: According to biologists, the cells in our bodies renew themselves in seven year cycles, and experientially, my beliefs/truths transform in a similar time frame. I no longer believe several key stories I was convinced of just five years ago. Even people’s core beliefs, often matters of faith, are subject to alteration: the Jesus someone believed in at 3 is not the Jesus they know at 30 or 60. To be fair, I think the kind of truth Lamott points to in her book on writing is “gut level honesty,” but still, what is that? In her essays she uses a lot of self-revelation. She walks that tightrope successfully because her personal stories fit and illustrate the points she is trying to make, but it’s one of those “don’t try this at home” kind of things. Luckily, most bloggers I follow use self-revelation appropriately too. Perhaps it’s because we know a post goes to Everyone, and that understanding makes us circumspect. For me, “truth in writing” is one of those abstractions, like “voice,” that it’s better not to worry about. We may “know it when we see it,” but operationally, it’s better to simply write, then post, then write again. If I “set out to find my voice,” I am guaranteed to be silly at best. At least that is my truth for today. Next week or next month it may be something different, but that’s ok. Pretty natural, I believe. When you really think about it, most “truths” do not have a very long half-life. This entry was posted in Authors, Blogging, Writing and tagged authors, blogging, writing. Bookmark the permalink. Truth is as elusive as a drop of mercury on a Teflon skillet. We each need to find our own, and it is seldom an easy task. I remember loving reading Black Elk Speaks, but had forgotten the wonderful opening. Thanks for the reminder and for the post. Thanks, Rosi. It was nice to open Black Elk again. It had been a while. Black Elk is one of my all time favorite reads. Although I am not Native American, I grew up on the Osage Indian Reservation in Oklahoma, and have always been interested in Native American culture and spirituality. 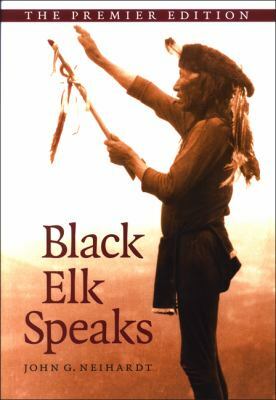 I first read Black Elk Speaks when I was a 19 year old undergraduate student, and I can attribute it, in addition to the Lotus Sutra and the Bhagavad Gita, as one of the books that inspired me to set off on my spiritual path. I know exactly what you mean. I probably read Black Elk around 19, and later spent a lot of time in the Four Corners area, visiting pueblos both ancient and still occupied, and the excellent museums in Flagstaff and Santa Fe.